Knave over Queens (2018. 550 pages) is a shared world collection of short stories edited by George R. R. Martin. Many of the authors have more than one story included which adds continuity to their tales. The stories are all set in Great Britain and the time ranges from 1946 to 2017. As the tales do not share a single author, they also do not share a single voice or tone. The contributing authors include Paul Cornell, Marko Kloos, Mark Lawrence, Kevin Andrew Murphy, Emma Newman, Peter Newman, Peadar O Guilin, Caroline Spector, Charles Stross and Milinda M. Snodgrass who also helped with the editing chores. The opening story, A Flint Lies in the Mud, by Kevin Andrew Murphy is a case in point. Although the story is set just after the end of the Second World War, it has more in common, tonally, with a tale set much earlier in time. It may have been the layer of privilege and class, which feels unusual. That said, it sets up the shared world well with the introduction of the virus, first into New York and then on to the Queen Mary cruise ship. The story sets up how the virus creates a lottery of outcomes. Foxworthy, a reoccurring character is transformed into living stone, not a bad outcome as just as many others gain great strength or great beauty, at the cost of their genitalia. Others melt or transform into things incompatible with life. The stories which follow explore what this new paradigm will mean to both society and individuals. For the most part the following stories place the protagonists in familiar historical contexts. This does mean that the book, overall, misses out on describing the global effects of the infection. If 9% of those infected become ‘Jokers’ with crippling effects and 1% becoming ‘Aces’, those blessed with superpowers, the high kill rate should have very much depopulated Great Britain with massive social effects. However, after putting forward the initial premise this is never addressed giving the impression that the effects on the population remained minimal. Of course, this does mean that the various authors can place their stories against notable characters and important events. Some changes have been made to the timeline. Margaret is Queen and Winston Churchill remains Prime Minister. Other than this history remains on a similar track to ours with stories set with the Krays, the troubles in Northern Ireland and involving existing historical figures like Alan Turing. The book contains no index for the separate stories which further confirms that the intention is that you read the book as a single novel. 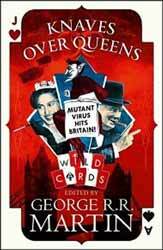 This is the latest in the ‘Wild Card’ universe of books which started in 1987 and has contributions from more than forty authors all sharing the basic premise of mutation through an alien virus. This is more of an anthology presented as a novel, so events at the beginning of the book do not build to any specific dramatic climax, it’s more of another chapter in an ongoing saga. This does not mean that you need to read any of the other books as the stories here work well as standalone tales.